What has been a long and stormy summer seems to finally have turned into fall, and it’s about time because there are many things to look forward to with fall at High Meadows Golf & Country Club. The Fall Festival, which will be on October 13, is a great time to get together with friends from the community. There’s still lots of time for great golf before the cold temperatures set in, and the colors from the leaves changing on the mountains provides the perfect backdrop. Beyond High Meadows Golf & Country Club there is plenty to enjoy as well, whether it’s a drive along the Blue Ridge Parkway or a hike up Stone Mountain. And one of the much-anticipated events for the local art community is the NC Mountain Arts Adventure. Held October 19-21, artists from around Alleghany County open up their studios for people to come learn more about their craft, see them in action and possibly find a unique piece to add to their collection. One of the best parts of the studio tour is the opportunity to interact personally with the artists. In talking with them you get the chance to learn about how they grew to love art, what their passions and inspirations are, and what they love about making a living with their craft in the beautiful mountains of Alleghany County. 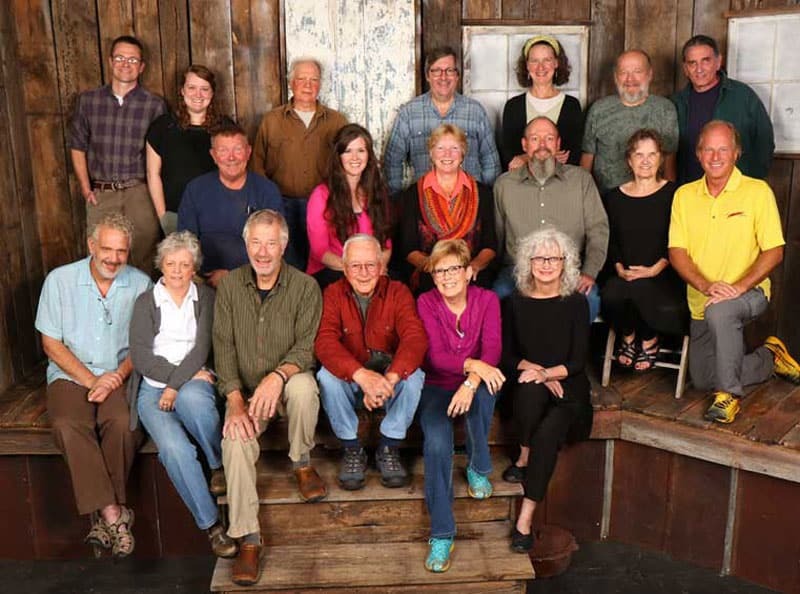 This fall there are 12 artists participating in the event, and if you visit every studio you will not only get the chance to see a lot of great art, but you will also drive through the scenic mountain highways and have a chance to truly soak up Mother Nature’s art display this time of year. Blue Ridge Woodcrafters. Handmade wooden accessories and furniture made from native wood including oak, poplar, walnut and wormy chestnut. Jewelweed Studio. Copper foil method stained glass design. Durgin Originals. After a life spent up and down the East Coast, from the Jersey Shore to Key West, Chris Durgin found himself settled into Sparta. Here he has brought his talents as a carpenter to a new level, making guitars in addition to furniture. Carolina Farm Table. Handmade furniture crafted from new and reclaimed local wood, designed and built by the Ulery family. Studio Roxie. Fine art photography by Stewart Royall. Pottery Place. Various artists come together at this studio which features pottery, barn quilts, turned wood and felted glass. Cater Pots. Daniel and Robin Cater each bring their own style to their pottery. Daniel builds unique sculptures and Robin uses the potters wheel to create many beautiful yet functional pieces. “A Bird in Hand …” Dan Abernathy has been carving and sculpting birds for more than 30 years, and his lifelike birds have won many awards. Mountain Jazmin Baskets. Kathryn Abernathy weaves baskets of all shapes and sizes, and watching her at work is an art in itself. Mangum Pottery. Robin Mangum is a household name in Sparta and the surrounding area. In 1974, he and his wife Bet began creating pottery both decorative and functional. They grew a national following for their one-of-a-kind work, and since Bet’s passing in 2009 Robin has continued to expand the direction of the studio and built on their legacy. Pottery by Jes. Jessie Smith creates functional and artistic pottery with natural and organic aspects incorporated into her work. Hughes Glass Studio. Ronnie Hughes, glass artist, uses traditional flameworking techniques to create wildflower sculptures.